Little Cypress Intermediate campus is celebrating their 10th year in the “new” campus! 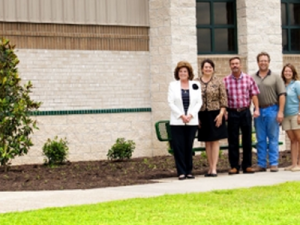 In honor of this, the Beautification Committee at Little Cypress Intermediate made landscaping their goal this year. With the help of generous local donors phase 1 of a landscaping project has been finished. The large front bed has been landscaped with 2 magnolia trees and some 23 bushes. Donors included Orion Engineered Carbons, Printpack, Frey’s Nursery, and Lana Griffith of Griffith Family Health and Convenient Care Center. Pictured, Supt. Dr. Pauline Hargrove, Principal Julia Dickerson, James Harrison, Printpack, Mark Frey and Mallorie Henning of Frey’s Landscape .